Are Stock Markets Rallying For The Right Reasons? In the month of July, gas prices crept up an average of $0.31 per gallon. Gas, in general, is a major component that runs through the blood stream of the American economy. As gas prices go up, it causes a ripple affect across the economy in goods and services that rise proportionately. While we all know the affect of gas prices on what we buy and do everyday, the government has stated in recent reports that there is no inflation at the consumer level. It is certainly clear that not to be the case. 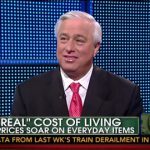 Ed Butowsky, wealth manager, financial advisor, and managing partner of Chapwood Investment Management, joins Fox Business’ Varney & Company to debate the fact that the Consumer Price Index (CPI) that the Government reports is incorrect and the Ed’s Chapwood Index proves to be much more realistic in terms of reporting the REAL cost of living increase. How do you feel the results of the upcoming election might effect your personal cost of living over the next four years?